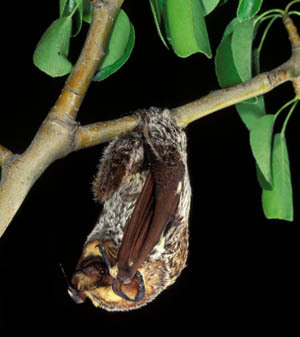 Description: The Hoary bat (Lasiurus cinereus) is very distinctive in it’s coloring. It has dark chestnut brown fur and yellowish fur that goes around the wings and the tips of it’s hairs are white. It is 136 mm in length and weighs 20-35 g.
About the Hoary Bat: Hoary bats are tree-roosting bats, meaning they live in trees that are typically 3-19 meters off the grounds. They are mostly solitary, sometimes living in family groups, and will give birth to two pups. They are migratory, but where they migrate differs between males and females.